When umpire Tom Woodring's check swing call angered Rays batter Mallex Smith on Tuesday, Tampa Bay's broadcast utilized a camera angle to suggest Smith didn't go, while Washington's replay suggested a strike. Why the discrepancy? 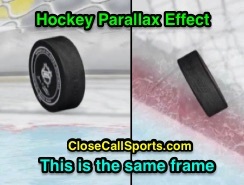 Answer: Parallax, an effect known to hockey fans for quite some time that applies to any sport with variable camera angles. The origins of parallax go back to Ancient Greek (parallaxis), but the theory behind this visual oddity is rather simple. When a viewer looks at a distant object in front of a background which itself is at any amount of distance (even just inches) from the object (here, we're looking at a bat on the background of either home plate or Smith's own body), the angle with which the viewer sees the object from will dictate how this object appears in front of the distant background. Parallax effect in hockey: Same timecodes. Hockey: Parallax plays a huge role in hockey's use of limited replay—namely when reviewing whether a puck has entirely crossed the red goal line. Because the red line itself is painted about an inch below the ice surface, even a puck that lies flat on the ice is subject to the parallax effect, as demonstrated by the accompanying image. For accuracy's sake, a top-down view is required to conclusively adjudicate most goal line plays. Baseball (Woodring/Smith Check Swing): Accordingly, Washington's replay angle from the camera well located closest to the first base line extended provides us with a view that is more suggestive of a "swing" than Tampa Bay's angle, which is located farther along foul territory on the third base side of the field. 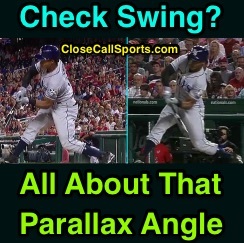 This explains why two different angles might have made Smith's check swing look like two different events. What big league baseball does right in regard to check swings is consistently have the home plate umpire call the initial pitch, and, if necessary, refer to the first or third base umpire on appeal. This provides a consistent angle up the respective foul lines for the field umpires, who, due to parallax, are more apt not to rule a swing than the plate umpire. What this means is that if a base umpire rules "swing" so as to affirm the appeal, that base umpire will have adjudged the swing from an angle less suggestive than the plate umpire's angle of a swing. This ensures the base umpire's election to overturn the "no swing" call at home plate is based on a higher threshold of evidence to suggest that the batter did, in fact, swing. In other words, all else equal, given the differing angles (and assuming that pitch location is so far in the dirt so as not to be a distraction for the plate umpire), a plate umpire is more apt to rule a swing on a 50-50 play than a base umpire is for that same exact check swing, due solely to the parallax angles. Image of red line for parallax coin experiment. A simple experiment you can conduct at home to illustrate the parallax effect requires just your smart phone and a small coin. In order for the demonstration to work, your phone will need to have a screen that is underneath the glass. Generally speaking, the distance between the LCD, digitizer, and front glass lens is nary a millimeter, but even this is enough to demonstrate the parallax effect. Step 1) On your smart phone, open an image of a red line (such as the one attached to this article). Step 2) While looking directly overhead ("straight down") the phone, place the coin flat on the phone's screen so only a tiny portion of its edge is over the red line. Step 3) Keeping the phone and coin stationary, adjust your head height and overall depth, as if simulating a camera in motion. Notice how from certain angles ("in front"), the coin appears entirely not in contact with the red line while from other angles ("behind"), the coin appears greatly in contact with the line.